This easy to make dough made with PHILADELPHIA Cream Cheese is the perfect dough for these jam-filled cookies. They will be a hit with family and friends at your next cookie exchange! Beat cream cheese, butter, sugar and vanilla with electric mixer on medium speed until well blended. Add flour; mix well. Cover. Refrigerate 30 min. Place dough on floured surface; roll out to 1/8-inch thickness. 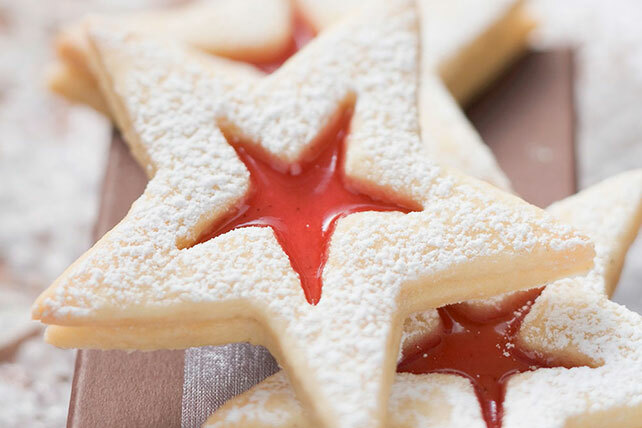 Cut out with 2-inch star cookie cutter to make 72 stars, rerolling dough scraps as necessary. Cut a smaller star shape out of the centre of half of the cut shapes. Place 2 inches apart on ungreased baking sheets and bake for 10 to 12 min. or until lightly browned. Cool 3 min. on baking sheets; transfer to wire racks. Cool completely. Spoon 1/2 tsp. jam on the cookies that are whole. Sandwich together with cut out cookies. Dust with icing sugar. Use your favourite cookie cutters. Prepare using Kraft Pure Strawberry Jam.